When a beehive gets too large the hive splits. Half of the bee colony (2,000-6,000 bees) move out traveling as a swarm, creating a visually bizarre phenomenon. While traveling to start their new home, bees may rest on a bush or tree temporarily (up to 3 days). 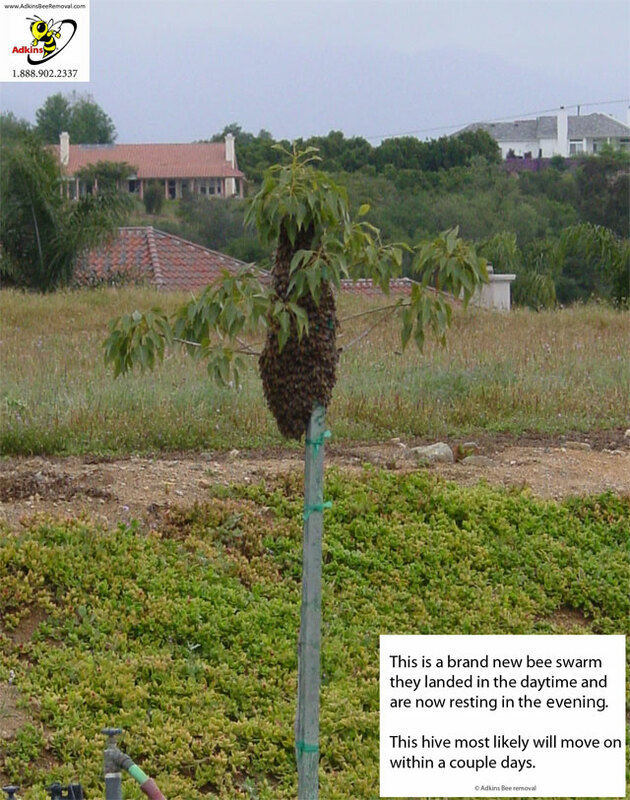 A bee swarm in this phase is usually about the size of a football or basket ball. If the swarm of bees is new, they will be non aggressive. This is because they have no home or domain to defend yet and there is no honey or young to protect. It may be suggested that the best way to get rid of these bees is to leave them alone. Perhaps about 90% of the time the bees will move along within a few days. Bothering or disrupting bees may frustrate their plans and could cause them to stay longer than normal. If you are trying to get rid of an established hive on a tree or bush and you live in a non-africanized honeybee removal state, you may also look for a beekeeper. If you live in a county where africanized bees exist, you can pay to have them removed alive as opposed to extermination. Exterminators get rid of the bees but often charge more than a bee removal company that removes the bees alive. If you try to get rid of the bees yourself, make sure no people or pets are close by, plan your escape route, and expect to be stung! If the bee hive is established, it is considered unwise to attempt to remove it yourself. Late this morning we had a swarm of bees come over our wall and land in the Ash Tree in our backyard. My biggest concern we have 2 big dogs, black and brown, and I read bees think they are bears that color!!! Our dogs sense something isn't right and now won't go outside. I'm a little concerned with all these stories of bee swarming and harming people. When should we be concerned. Our exterminator told us they should leave in 24 to 48 hours. We thought it would be better to check with trained Bee Keeper people. Please advise. Thanks. Beekeeper: Hello Patricia, I believe your exterminator is right in this case, the majority of the time, the swarm should leave by itself. The good news is that a new bee swarm like you described is not commonly aggressive. This spring, Arizona has experienced a lot of aggressive honeybees in the news, but this is generally associated with established bee hives that are often disturbed, and at times provoked. If you choose to remove the bees, we prefer live bee removal vs a bee exterminator. Here is our Phoenix Bee Remover if you�d like to give him a call. Good luck. We have a swarm of bees in the tree in front of our house and the tree belongs to the city. What would we be able to do about this because I am allergic to bee stings and my son may be also. Beekeeper: Dear Debra, All cities, that I am aware of, have a service that will remove the bees on city property or county property. Generally these bees will leave on their own when they are on a bush or a tree. We are planning to add a page to our site that has City and County numbers for this situation. This table provides info on whether your county provides free swarm removal. You can also update the table. Los Angeles, L.A., Long Beach, San Diego, Orange, Riverside, San Bernardino, Ontario. San Jose, San Mateo, San Francisco, Oakland, Sacramento. Reno, Tucson, Phoenix, Tempe, Mesa, DFW, Dallas, Fort Worth, San Antonio, Austin, Houston. New areas include: Albuquerque, Atlanta, Baltimore, Boston, Buffalo, Colorado Springs, Charlotte, Chicago, Cincinnati, Cleveland, Columbus, Denver, Detroit, Indianapolis, Jacksonville, Kansas city, Lexington, Long Island, Louisville, Memphis, Miami, Milwaukee, Minneapolis, Nashville, New York NYC, New Jersey, New Orleans, Newark, Oklahoma City, Omaha, Orlando, Palm Beach, Philadelphia, Phoenix, Pittsburgh, Portland, Raleigh, Rhode Island, Santa Ana, Seattle, St. Louis, Tacoma, Tampa Bay, Trenton, Virginia Beach, and Washington DC.